My name is Peter M Moriz. I live at Moonee Beach, Australia. I’ve just started to do sketching. This is my third sketch I’ve attempted. The other 2 were of small g/c’s….. 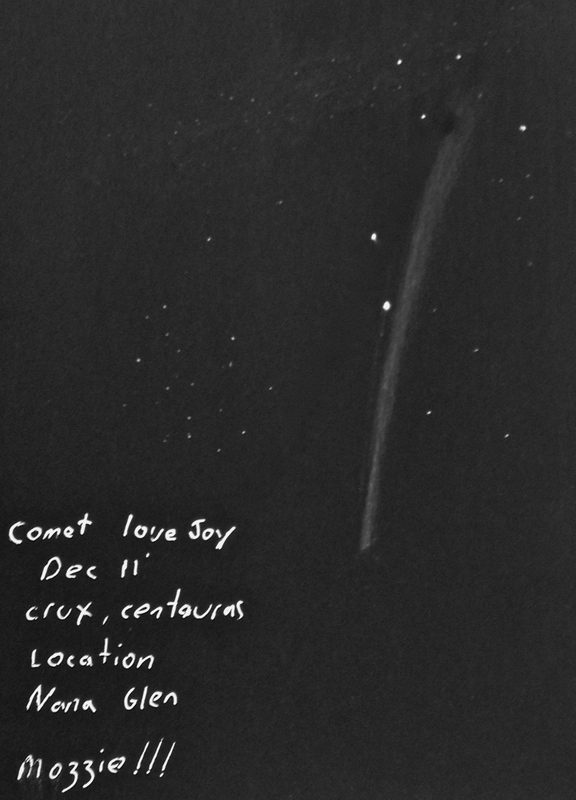 This sketch was done at Nana Glen west of my home town to get a little darker skies to see more of the comet’s tail. It was done naked eye and it goes from horizon to crux, say around 30 to 35 degrees. I put the milky way in the top of sketch to get some idea of how big the comet has become. The Coal Sack is there as well….it was done on the 28th of December 2011 and around 3.30am and had taken me around 45 minutes to do..I hope you enjoy the sketch–Alex, a fellow sketcher here in Australia, said I should submit it. Thanks for the time to read and view my sketch. Weather and light pollution snuffed out my chance to see this sungrazer comet. Great sketch and fabulous achievment with this ASOD. Nice sketch. It truly has become a spectacular comet. That is a very fine sketch of a spectacular comet. You are very lucky in soputh emisphere!!! Great sketch,but the instreument are….? thanks all for your comments,i’m enjoying my sketching and it;s something that i want to pursue…..
astropig there was no equipment it was naked eye,we were lucky to have a nice bright comet like this…i tried to see it the other morning but it very faint know…. Very good Sketch from a increadable Objekt!!! Very fine! !